Let this dish from Northern Africa help you survive the winter. When the weather dips into arctic temperatures, there's nothing like a pot of simmering stew to make us feel right again. While you can never go wrong with the classic choice -- beef stew -- we think it's nice to bring a little excitement into our wintery kitchens with recipes from North Africa. We might not be able to feel the sun of the Sahara, but we can at least taste the bold flavors of that hot culture through its tagine recipes. Tagines are versatile stews, usually chicken or lamb, slowly simmered in a traditional two-piece clay pot. (Actually, the name tagine refers to the pots they're cooked in, not the dish itself.) The pots were designed for slow cooking and optimal moisture retention, which means fall-off-the-bone meat stews every single time. If you don't have a tagine, you can still get the same results with a regular pot or even a slow cooker. 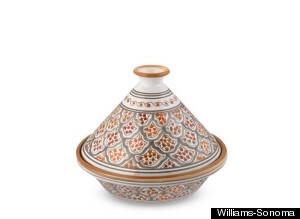 The cooking vessel is not important, what matters most with tagines is to capture the bold flavors of Morocco. Its preserved lemons, briny olives and sweet dried fruit will create a meal that'll melt your hardened winter heart in just one bite.